Born in Indonesia on July 8, 1971, John Juanda is a man who has made poker his life. John came to the U.S. in 1990 to study at Oklahoma State University. He later received his MBA from Seattle University. Juanda has spent some time as a door-to-door Bible salesman, and was also interested in being a doctor, a career he said he would have today if he had never gotten into poker. John Juanda started playing poker tournaments in 1996. He didn’t have a major victory until 2001, when he won the World Poker Open Championship. That was the start of a long and glory filled career for John Juanda. In 2002, he won his first World Series of Poker bracelet, playing A-5 Triple Draw Lowball. 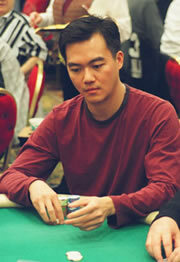 In 2001 and 2002, John Juanda was runner-up for Card Player’s Tournament Player of the Year award. Also in 2002, John was named Tournament Champion of the Year. In addition to these awards, Juanda has won three Best All-Around Player awards. John Juanda has kept rolling along since. In 2004 he won the first Professional Poker Tour event, and made 14 other final tables that year. John achieved fifth place in both the Five-Star World Poker Classic and the National Heads-Up Poker Championship in 2005. The Crown Australian Poker Championship took place in January of 2006, and John Juanda won to take down the 1,000,000 Australian Dollar first prize. Recently, John won $500,000 in Monte Carlo, while playing in the Monte Carlo Millions Main Event, in which he placed sixth, The FullTiltPoker.Net Invitational Live from Monte Carlo, in which he placed second, and in the Monte Carlo Millions Consolation Tournament, which Juanda won. John Juanda was formally a member of the Full Tilt Poker team, and played online exclusively with his Mac computer.